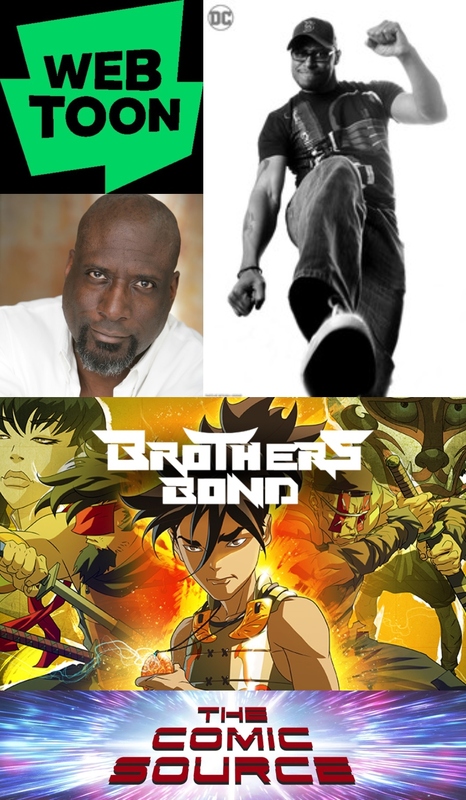 Jace chats with the creators for Brothers Bond, an Eisner Nominated Digital series from Webtoon. So many layers to the story of Yoshi, honor, loyalty, duty redemption, justice, was it always your plan to have such a rich story? Or did it happen organically in terms of themes? Has there been anything about Yoshi’s journey so far that you’ve changed over time? Or has it all gone according to plan? How about Yoshi, was he the most challenging to characterize since he was first, or did that make it easier and then you built around him? I would say that reading Brothers Bond is more than just reading a webcomic, it is really an experience with the motion, the music and the vertical scroll combing to make something unique, can you talk a little bit about the decisions you made in the planning stages to create such a unique comic? Can you talk a little about who you are collaborating with on the book and what that process has been like? Let’s talk about working with Webtoon, why was this the place for Brothers Bond? Have you had a chance to meet and interact with other Webtoon creators? Do you think it is important to bridge the gap between digital creators and creators who work in the more traditional format? Is the future of comics digital distribution? Ryan Benjamin began his professional comic book art career with Image Comics in 1994 which branched off into Wildstorm Comics and continued working with Marvel, DC, DarkHorse, Acclaim, and Valiant Comics. Many years of working with Jim Lee, Whilce Portacio and Marc Silvestri, his path as a professional comic artist lead him to work on top-selling comics like Brothers Bond (2018 Eisner nominated), WildCats, Grifter, Uncanny Xmen, Star Wars, Spawn, Captain America, Iron Man, Grifter/Midnighter, Batman, Batman Beyond(#1 in the NY Times), Wonder Woman, and many more. Ryan eventually became a video game 3D artist for 16+ years, with 11 of those years as a senior artist at Sony Entertainment. A variety of his work as an artist/designer can be seen in video games like DC Universe (DCUO), Marvel MOBA games, and Television shows/movies ThunderCats, Ultimate Spiderman, Little Man, Pacific Rim 2, Megaman, and Mech X4. As an actor, he has been seen in such films as The Mask, Steel, Congo, Tim Burton’s Planet of the Apes remake, and the 2003 vampire vs. werewolf film, Underworld. Underworld was Grevioux’s first produced writing credit. He came up with the original concept/premise and wrote the original screenplay along with director Len Wiseman, launching the Underworld franchise. He appears in the film himself as a lycan, Raze, and returned as the character in the Underworld prequel Underworld: Rise of the Lycans, which he will also be adapting into a comic book mini-series. He also expressed an interest in telling more Underworld stories in comic form if this proves successful. Early 2006 saw Grevioux form two comic book imprints, Astounding Studios and DarkStorm Studios. Grevioux’s Astounding Studios imprint was to focus on all-ages titles such as Valkyries, Guardian Heroes and The Hammer Kid. The Darkstorm Studios imprint was a more mature line, including the books Alivs Rex,Skull and Guns and Uzan, The Mighty. Grevioux’s voice is distinctively deep. In the commentary track of Underworld, he relates that during the promotion and launch of the film, many fans asked him if his voice had been altered by computer, and were surprised to learn that it had not been. Grevioux wrote Marvel Comics’ New Warriors volume 4. Grevioux also wrote Adam: Legend of the Blue Marvel, a character he created years ago as a young teenage comic book fan. The mini series was drawn by Mat Broome and Roberto Castro. He is also in the process of writing a story featuring Lee Falk’s characters The Phantom and Mandrake the Magician, co-written with Mike Bullock. He will also be writing ZMD: Zombies of Mass Destruction for Red 5 Comics.